To find an office you won’t outgrow before your lease is up — and a space where your employees will thrive — consider these 3 factors. Part of planning for your startup’s success is finding the right working space for your team and your clients. Property’s expensive, and leases are binding; when you’re in a rapid-growth phase, how can you predict your office needs a year or two from now? Maybe you’ll add two new team members — will they need offices? If you plan to add a new department in the next 18 months, will you need larger meeting rooms? 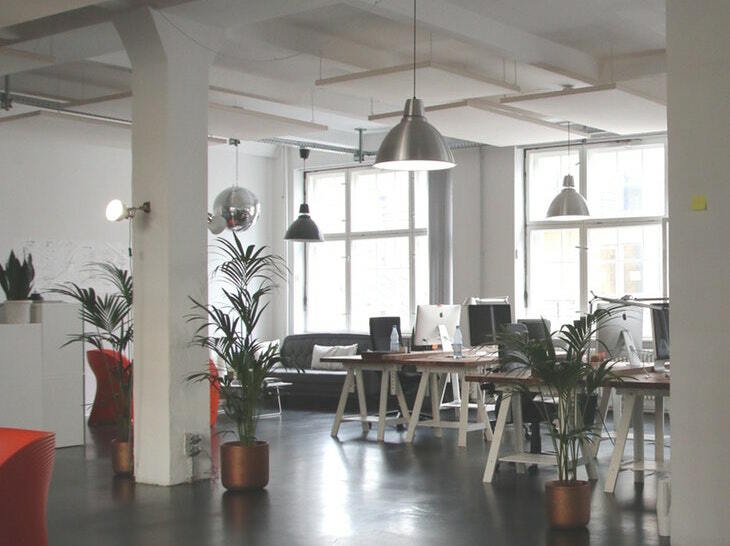 If you want to attract top talent, will your office environment appeal to them? Business owners and founders of growing companies face a practical dilemma when it comes to office space. There is no such thing as a perfect lease for a company that is growing fast. Getting the space right is vital to the health and development of your company, but it can be like trying to pin down a moving target. You don’t want to bite off more than you can chew if the growth slows down or be bogged down by too-high rent. But you also don’t want to get trapped in an office space that feels claustrophobic or forces another costly move. My team recently outgrew our second office space, and I found myself in a puzzle-piecing quandary of balancing future needs with current resources. I figured we’d need space for at least 100 people — we currently have about 35 employees — but it wasn’t because we expect to triple our employees in the short term. Based on the build-out of the office space itself, we took a 7-year lease instead of the standard 3- or 5-year lease. Still, I know my company will outgrow the space in four years or less. It’s not perfect, but based on our revenue, we can either abandon the building without a huge loss until we can sublease the space, or we can expand to other floors of the building. Eventually, we’ll want to purchase a large building, but we have a few years before that’s feasible. In this office space search, I faced many variables that I didn’t consider at first — variables that many entrepreneurs might not account for until it’s too late. For instance, I paid attention to factors such as the office’s square footage, but I didn’t immediately realize how important parking would be, especially as we brought on more and more non-remote employees. The need for accessible parking forced us to choose between a rural setting with larger parking lots and a downtown location that would rely on public parking. We picked downtown because we knew the location itself would go a long way to attract top talent, and the dining options and general bustle will keep our younger staff members happy. How many people will need space during the terms of the lease? The first, and arguably most obvious, consideration is the actual size of your company. How many people do you employ now, and how many do you predict hiring throughout the length of the lease? On average, you need between 150 and 350 square feet per person (or as low as 50 square feet if you have a really condensed work space). The right figure will depend on how much equipment employees need to perform their respective jobs, whether they need private offices, whether you plan for an open space, and other specific factors. Don’t forget to account for remote workers if they visit regularly. How long of a lease makes sense for your growth? In general, commercial real estate firms will push for the longest leases possible to maximize their bottom line. They also expect you to squeeze out as many concessions as possible, so negotiating is an extremely important process. Choose a space you can move on from when you’re ready without it being a financial drain. Demand concessions where appropriate, such as a lower monthly rent or allowances for any improvements you make. The longer your lease, the more power you’ll have to negotiate such concessions. Still, my advice is to opt for shorter leases to mitigate risks, especially during a business’s early phases or in times of predicted growth. What else is important to my employees’ day-to-day lives? Employees don’t want to fight for a parking spot every morning — and some might prefer public transit, depending on the city you live in. Similarly, are bike racks available? In many areas, commercial parking is regulated by law, and companies such as Apple devote more space to parking than the offices themselves. It might make sense for your company to be in a more rural setting, or it could be important to be closer to shops, restaurants, other businesses, and clients. Recognizing these needs sheds light on the importance of comprehensive space planning outside of just office capacity. The lease you sign now and the space you commit to will be an essential part of your company for the next few years. Consider these three questions before you sign to make sure your office space is an asset, not a burden. Shay Berman is the CEO and founder of Digital Resource, a full-service digital marketing agency located in South Florida. Shay’s clear-cut approach to internet marketing has driven his clients’ businesses to new heights and allowed Digital Resource to land on the Inc 500 list after just four years. Digital Resource provides exceptional service in social media marketing, organic search engine optimization, responsive design, and much more.